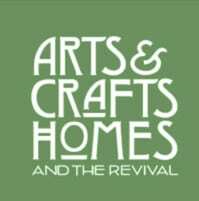 The Arts & Crafts community, its architecture and its output, continue to inspire. 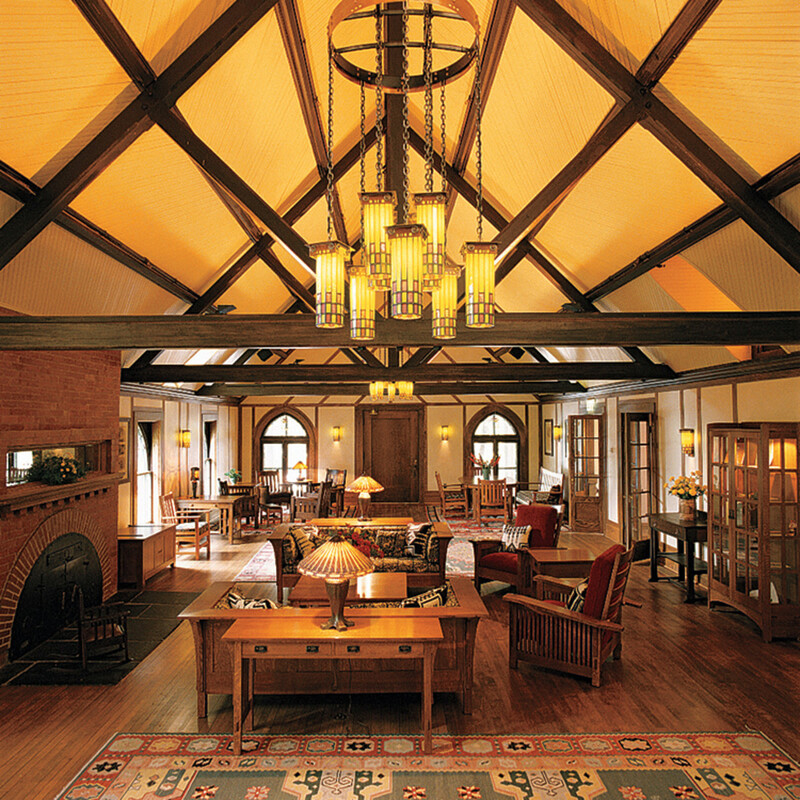 The Inn’s Reception Room has oak wainscoting and medievalist masonry fireplaces. 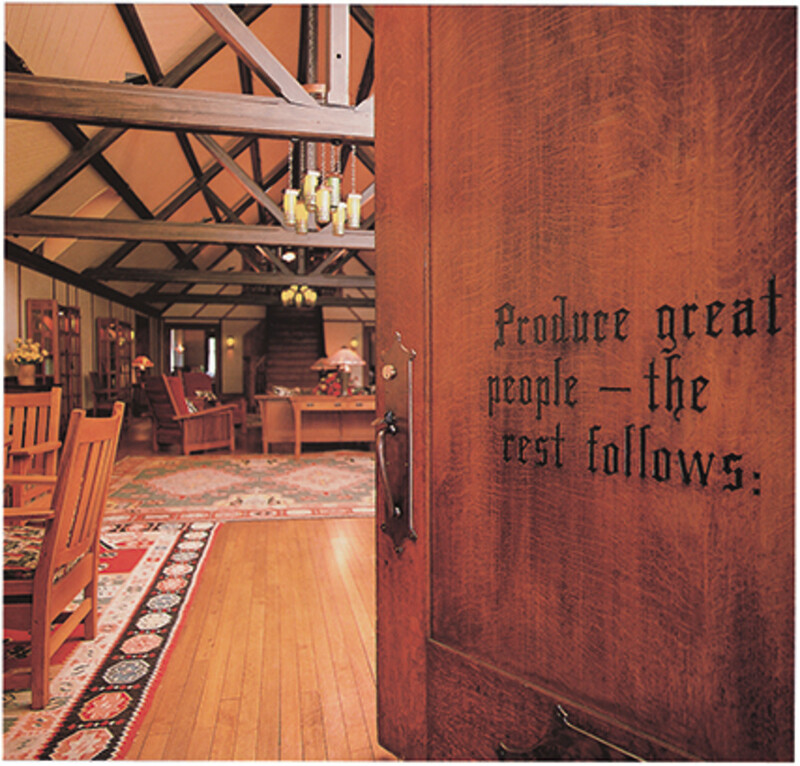 Roycroft founder Elbert Hubbard opened an inn in East Aurora, New York, in 1905, in the former Print Shop on his arts and crafts campus. Initially designed by Hubbard in a country Gothic style, inspired by St. Oswald’s Church in Grasmere, England, the Inn was remodeled and updated over the years but always with a focus on its Arts & Crafts mission. Rooms were identified by the names of famous people, including William Morris and John Ruskin. 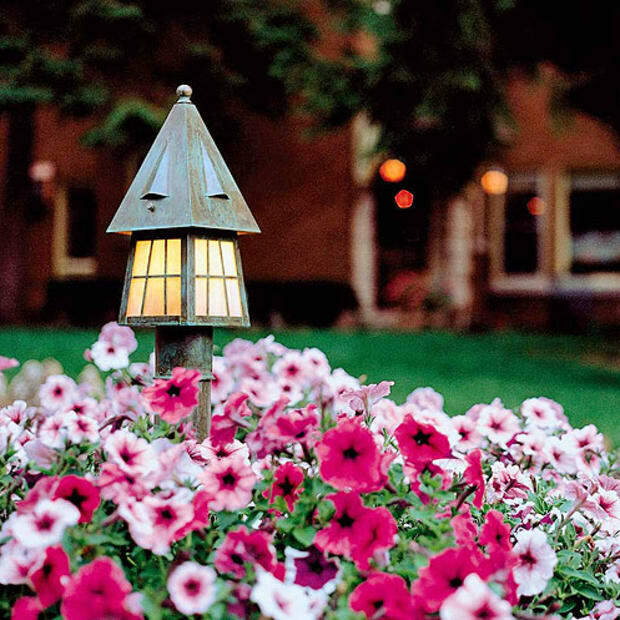 An uplifting welcome to the Roycroft Inn. Guests enter from the Peristyle (porch) through a heavy door with carved mottoes into the Reception Room. Oak wainscoting is highlighted by medieval-inspired, stone and brick fireplaces built by Roycroft craftsmen. The Dining Room was built in a portion of the building originally used for assembling printed books. Meals were prepared with fruits, vegetables, eggs, and grains from the Roycroft Farm. 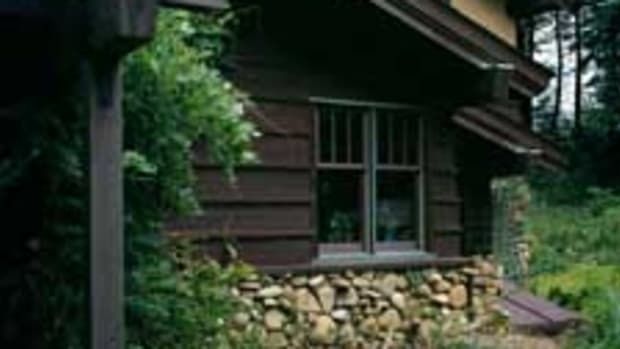 Today called Arden Farm, it is still run by a Hubbard descendent and provides produce for the Inn’s farm-to-table menu. 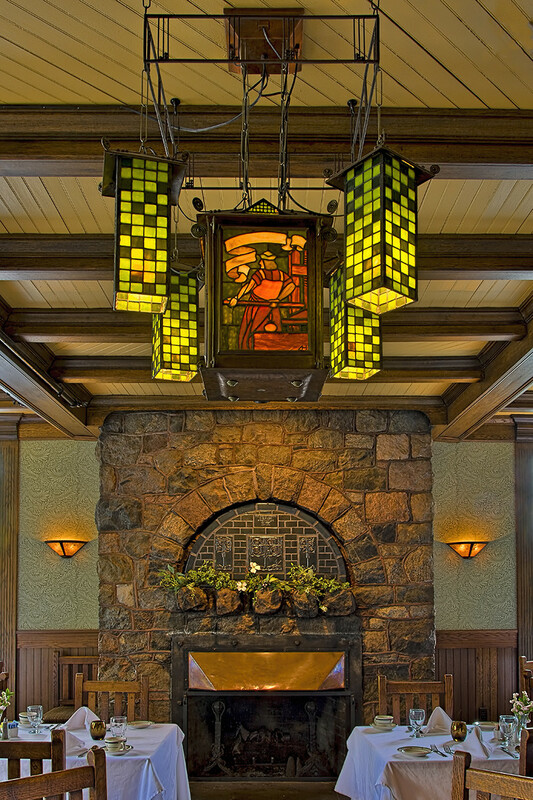 The Roycroft Inn is a National Historic Landmark. Roycroft architect James Cadzow designed a large, ground-level room at the front as a Salon or Music Room, for lectures and concerts. Murals by the artist and original Roycrofter Alexis Jean Fournier, all recently restored, depict the Eight Centers of Great Thought (the Roycroft Campus is deemed #8!). In the former Library, a hanging fixture designed by Dard Hunter ca. 1908. In 1904, the Peristyle was remodeled in a more contemporary Prairie Style manner influenced by Frank Lloyd Wright. Dard Hunter began working on the Campus, designing typography and electrified copper chandeliers with cutout hearts, which replaced earlier Gothic fixtures. Hunter designed new stained glass windows as well, replacing the building’s original Gothic windows with Glasgow School and Secessionist designs. After a trip to Vienna in 1908, Hunter added stylized stained-glass light fixtures to all of the public rooms. After 1915, the Roycroft Campus, including the Inn, was maintained by Hubbard’s son and the Hubbard family as a community of printers, furniture makers, metalsmiths, and book binders until 1938, when the buildings were sold following the Great Depression. Glasgow School roses by Dard Hunter in an original Gothic window. In the former Library, a hanging fixture designed by Dard Hunter ca. 1908. 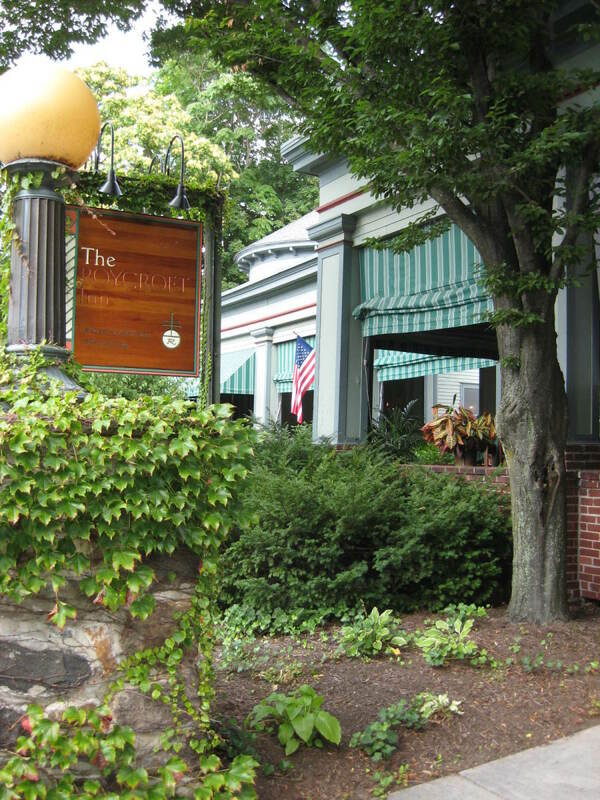 The Inn continued to operate until 1987, and was designated a National Historic Landmark in 1986. Over the next nine years, the Inn and remaining nine (of 14 original) buildings underwent an $8 million restoration. 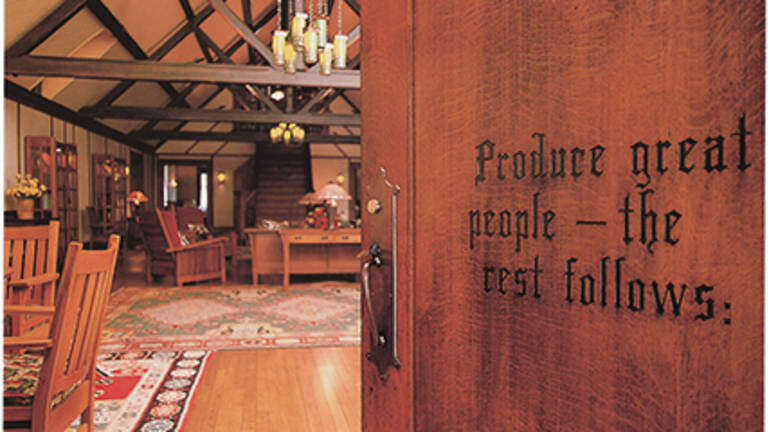 Since 1995, guests may once again relax in original Morris chairs made by the Roycrofters to read by the light of Roycroft lamps. Today’s juried Roycroft Renaissance artisans continue good work on Campus and around the country. The Roycrofters founder and periodicals publisher Elbert Hubbard in 1905. 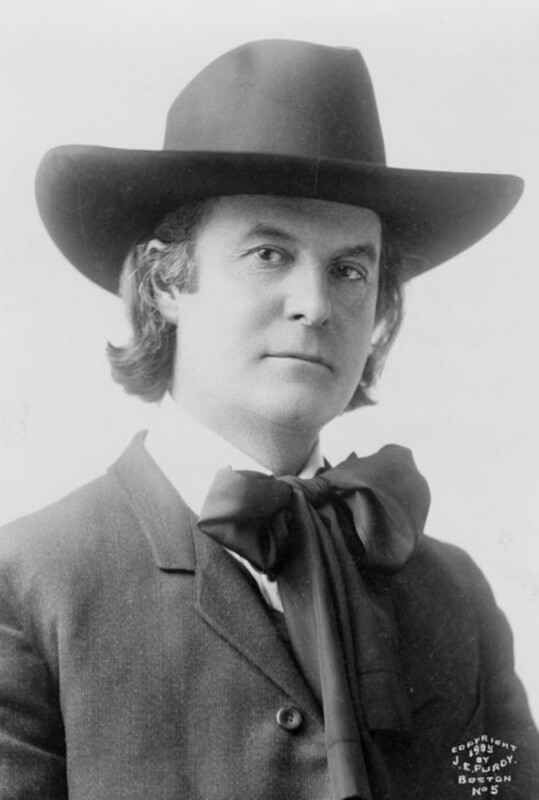 Elbert Hubbard (1857–1915) was an influential proponent of the American Arts & Crafts movement. A writer, publisher, philosopher, and artist, he founded a community for artisans in East Aurora, New York, near Buffalo, in 1897. 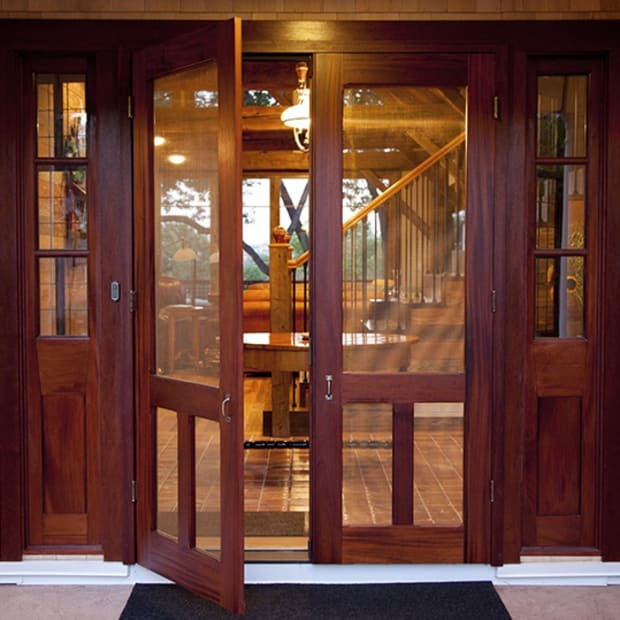 Hubbard named it “Roycroft” after the 17th-century London printers Samuel and Thomas Roycroft; the word also means “King’s Craft” in reference to the highly skilled guild members of medieval Europe. Hubbard borrowed from Ruskin for the Roycrofters’ creed: “A belief in working with the head, hand and heart and mixing enough play with the work so that every task is pleasurable and makes for health and happiness.” In 1899, Hubbard wrote an essay titled “A Message to Garcia.” A parable on initiative, conscientiousness, loyalty, and hard work, it was one of the most-published works of the period. 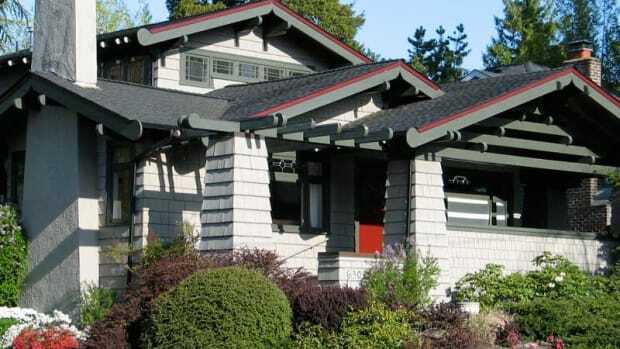 Its financial success allowed Hubbard to expand his Roycroft Campus. Hubbard and his second wife, Alice, were killed aboard ship when the RMS Lusitania was torpedoed by a German U-boat in 1915. 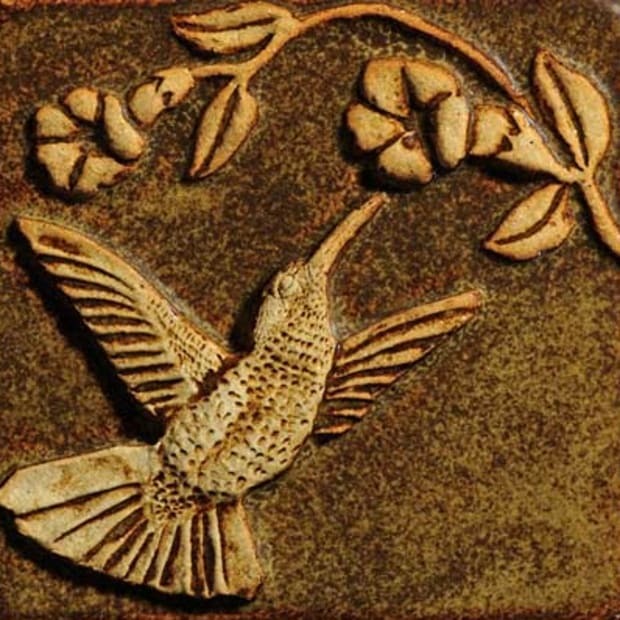 The annual Arts & Crafts Conference at the Grove Park Inn in Asheville, N.C., offers nonstop options. Here’s how to navigate. 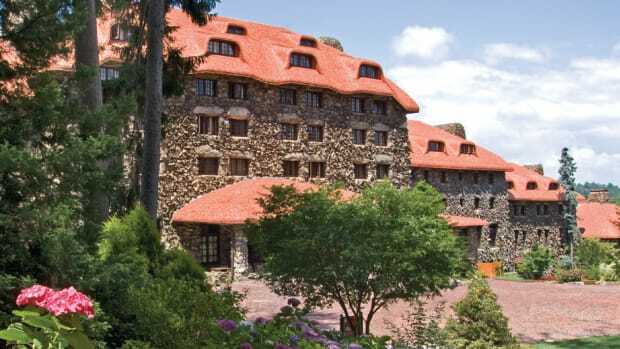 If you’ve attended the annual Grove Park Inn Arts and Crafts Conference in Asheville, North Carolina, chances are you’ve run into Jerry Morosco.